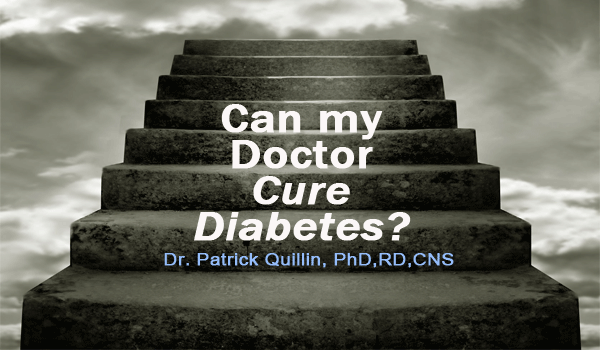 Can Your Doctor Cure Diabetes? Type 1 diabetic. Intensified insulin therapy, which is designed to mimic the flow of insulin in a healthy human. 3-5 injections of human insulin (or flow from an attached pump) are spaced throughout the day in accordance with meals. Outcome with Type 1 diabetes is vastly superior than even a few decades ago. In Britain prior to the discovery of insulin (1922), there were 119 deaths from diabetes per million people. After the discovery of insulin (1931) there were 145 deaths from diabetes per million population. That’s right, the death rate actually went up, because people increased the incidence of a self-destructive lifestyle and relied too heavily on the “magic bullet” insulin. Clearly, insulin helps to control the rampant complications from diabetes, but is far from a cure for the disease. Type 2 diabetic. Use of oral hypoglycemic agents, including sulfa drugs like Diabinese, Glucotrol, Micronase, and Orinase. These drugs seem to enhance insulin production and the sensitivity of the body cells to insulin. However, they lose their effectiveness with time and, according to a huge study by the University Group Diabetes Program, elevate the risk for death from heart attack or stroke by 250%. Other treatment drugs include metformin, the thiazolidinediones (TZDs), insulin, acarbose (blocks starch digestion), and orlistat (blocks fat digestion). All of these drugs have their considerable side effects, such as orlistat, which causes flatulence, oily stools, “rectal leakage”, and malabsorption of the fat soluble vitamins A, D, E, and K.
Circulatory system, including heart disease, stroke, poor circulation to the feet and hands. 80% of Type 2 diabetics die from heart disease. Shriveling of the tiny blood vessels leading to problems in the eyes, a.k.a. retinopathy. 15 years after diagnosis, 90% of Type 1 and 80% of Type 2 diabetics show some damage to the retina of the eyes. Kidney complications, or nephropathy. The vast majority of American patients on renal dialysis are diabetics. Nerve damage, or neuropathy, leading to tingling, painful, “pins & needles” sensations in the hands and feet. Nerve damage to the bladder, intestines, sexual organs, etc. and the consequences of losing the contributions from those organs or regions of the body. Ulcers of the leg and foot, which are combined problems of nerves and blood vessels. Yes. Since 90% of Type 2 diabetics are obese, weight reduction can dramatically improve blood glucose regulation and even cure the diabetes. Obesity may distort the “landing sites” for insulin on the cell membrane, not unlike blowing up a balloon larger than normal and watching the writing on the balloon become distorted. There is reason to believe that many people can dramatically improve blood glucose regulation merely by eating a “hunter gatherer diet” consisting of lean and clean meat (chicken, turkey, fish, lean beef and pork) along with complex carbohydrates rich in soluble fiber (vegetables, nuts, seeds, fruit, legumes) and insoluble fiber (whole grains). Researcher Dr. Kerin O’Dea in Australia wondered if the modern refined diet of many Aborigines living in Sydney, Australia could cause diabetes. She recruited 10 full blooded male aborigines who had Type 2 diabetes and asked them to return to the “hunter gatherer” diet of their ancestors. All 10 subjects were middle age and overweight. Seven weeks after beginning their ancestral diet, all 10 men had lost an average of 16 pounds in spite of making no effort to reduce weight, all had experienced a 50% drop in blood lipids (lowering their risk for heart disease), and all had such splendid improvement in fasting blood glucose levels that they were considered “cured” of Type 2 diabetes. Max Gerson, MD was a well-respected German neurosurgeon in the 1920s. He began treating “refractory” diseases of all sorts, including diabetes, lupus, and cancer with a basic program of nutrition and detoxification. Dr. Gerson used his simple program to cure the wife of the famous medical missionary, Dr. Albert Schweitzer, from advanced tuberculosis in 1928, and then cured Schweitzer himself of Type 2 diabetes, allowing Schweitzer to live another 15 years to age 90. Diabetes is becoming a great concern to the state and federal government because health care costs from Medicare and Medicaid have skyrocketed due to rampant diabetes. In the 1930s, a dentist Weston Price, and his wife/nurse, decided to quit their practices and travel the world in the ultimate “Indiana Jones” scientific study and adventure. Travelling on propellar planes to 12 cultures on 5 continents, they found that people who consumed their ancestral diet had both good teeth and generally good health. Once these people adopted the “western diet” (Read: refined carbohydrates lacking in fiber) then both the teeth and general health of these varied cultures began to rapidly deteriorate. Diabetes was virtually never seen in people who followed their native ethnic diet. Improve blood glucose regulation merely by eating a hunter gatherer diet. Note the following chart which shows that we Americans get 19% of our calories from simple carbohydrates, mostly white sugar. Our ancestors got almost no calories from simple carbohydrates, except for the brief harvest time for fruits in the summer and fall. The glycemic index of real fruit usually is much better than the glycemic index of refined sugars. Glycemic index basically tells us how fast the sugar gets into our bloodstream. More on the importance of the glycemic index later.